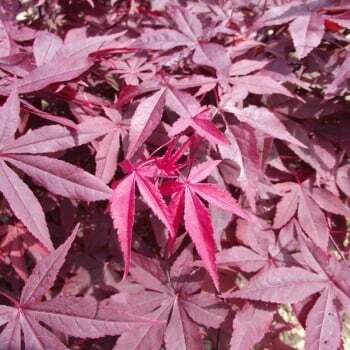 Acer palmatum 'Yubae' is an unusual variety with deep purple leaves that occasionally take on a crimson red variegation. The colour tends to fade gradually to green as the leaves grow closer to the inside of the crown. The leaves are somewhat translucent and create a light, airy effect, best appreciated on a sunny, autumn day. This Evening Glow Japanese Maple holds its colour well, even in shady spots but will provide a more dramatic colour display when planted in a sunny or partially shaded site. Japanese Maple Yubae makes a stunning specimen tree and has an eventual size of 6 x 4m. Pot grown Yubae Japanese Maples can be planted at any time of the year. Firstly, remove all weeds and grass within a metre of your desired planting hole then dig a square hole as deep as your root mass and approximately 2x as wide. To help your tree establish more effectively, we advise sprinkling root grow in the hole, especially if you have poor soil.